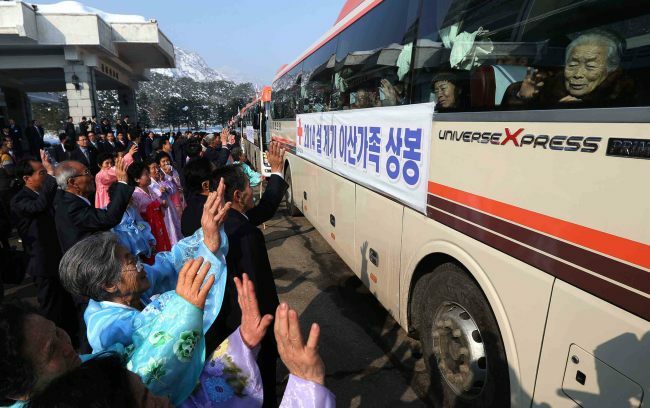 South and North Korean families who had been separated for more than six decades met for the fifth time on Saturday, the third day of emotional reunions at a North Korean mountain resort. The families were the first of two groups who were authorized to meet with their long lost relatives at Mount Kumgang, a scenic resort on North Korea's east coast. A total of 80 elderly South Koreans, accompanied by 50 family members, began their third day meetings at 9 a.m. as planned with about 180 North Korean relatives in their hotel rooms. The South Koreans are set to return home later in the day. Initially there had been 82 elderly South Koreans, but two had to return home the day before due to health problems. By the end of this three-day trip, the first batch of families would have spent a total of 10 hours with their North Korean kin.